Montana Ranch Adventures invites you to come and experience a real Montana Ranch adventure! The wranglers are friendly, helpful and enjoy life. We offer daily rides that will last a lifetime in memories. We also offer hourly horseback rides at St. Mary, across from St. Mary Lodge and Resort. Call 888-338-3054 for additional information. Ride the range with the majestic Rocky Mountains as a backdrop. No need to have previous riding experience. If you are an experienced rider, you will appreciate the quality of the ride and understand our motto: 'Real cowboys don't ride single file.' Some restrictions apply to young children. We have camping tipis, modern cabins including full service with kitchenettes and your own private campfire site. You will experience midnight skies filled with stars and days of adventures, serene beauty and contentment. Be Prepared: Long pants, outdoor shoes or boots, warm jacket, cap or hat, sun screen, sleeping bags, fishing tackle and rain gear recommended. 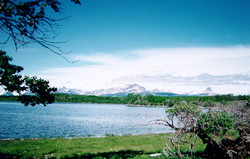 Directions: Montana Ranch Adventures is located on the Blackfeet Indian Reservation. Travel to Browning, Montana. At the east stop light turn north onto Highway 464, Duck Lake Road. Travel 30 miles to Duck Lake. Turn right at west end of Duck Lake and watch for signs. Travel gravel road for 1.3 miles and you will come to our office.